I am often amazed at just how the most unlikely and uninspiring of locations can have historical connections and a story linked to them if you dig a bit. Crossroads and boundaries are often associated with some event in history – and this is not a surprise as it is JUST those kind of places that bring friends … and enemies together. 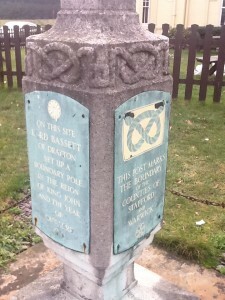 One such place is Bassetts Pole on the boundary of the West Midlands, Staffordshire and Warwickshire. Today it is a junction point where many roads meet and cross including the A38, the M6 Tollroad and the old A446 London road. There is a pub here and a Macdonalds restaurant. It is a spot where bikers gather in the summer and where they hold car boot sales. In nearby woods paintballers do combat. All these activities take advantage of the transport links that bring folk past the spot. Other than the activities though the spot is far from attractive. It is a ‘between place’ and not somewhere to linger except for the activity you have gone there for. Even less is it a place that you would fight over – except with paint perhaps. But once upon a time this was different. Men did fight and maybe die here. If we go back in time over eight hundred years to when it was all open heathland, a vague boundary existed here between the estates of the Bassett family who owned nearby Drayton Manor that of the De Frevilles who owned Middleton and the Grazebrooks of Shenstone. The heathland was not exactly a useful means of marking a boundary and it seems that a dispute arose between the families. This dispute became violent and there are recorded episodes of several armed encounters at this spot between young men from the bordering estates. The inscription reads: “On this site Lord Bassett of Drayton set up a boundary pole in the reign of King John and the year of Our Lord 1201”. Stating that it was the boundary of Warwickshire and Staffordshire. 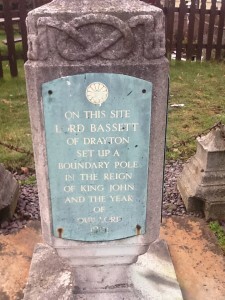 The pole became something that survived long after Lord Bassett’s death. It was replaced and rebuilt over the years and indeed in the 19th centuries the Pole was tall enough to be visible for quite some distance. This enabled travellers to find their way across the heath. The years moved on and on the advent of the motorbike age the pole became a gathering spot for bikers even as early as the 1920s. A night club opened here in the 20s called The Blue Lagoon and the ‘Flappers’ from Birmingham apparently enjoyed meeting the bikers here. The Home Guard were stationed at this important road junction during WW2 and later a Tank testing track was built in the nearby Wood. The tanks and home guard are long gone but these days the woods and fields are home to the largest paintball attraction in the UK. I find town and place names interesting and in this case – Bassetts Pole – it means what it says on the tin.